Little is known about this fast paced, energetic and non contact sport. Tchoukball, pronounced ‘chuke-ball’ is a combination of basketball, volleyball and squash. 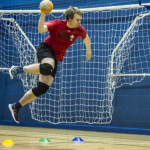 Jen joins Andy Haigh, Competitions Manager for Tchoukball UK, during a training session at Bournemouth University to find out more about this in a ‘fast paced, energetic and non contact’ interview.